The company's soft outlook for the holiday quarter ruined what was a solid year overall for the leading game maker. It was an up and down year for the Call of Duty maker last year. 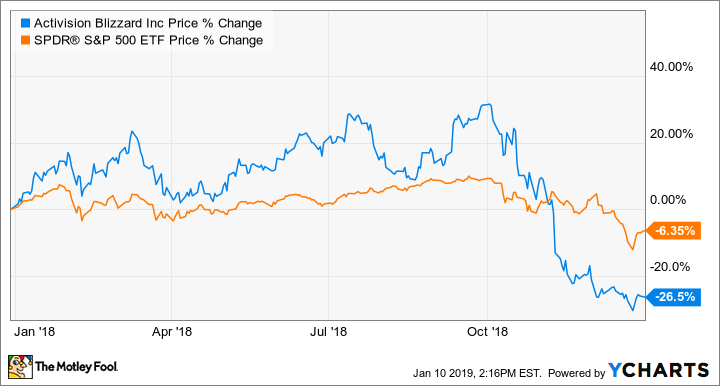 Activision Blizzard's (NASDAQ:ATVI) momentum in the first half of the year was wiped out in the last three months by market turbulence and concerns about weak engagement in its core franchises. Through the first three quarters of 2018, Activision grew total revenue 2.9% year over year to $5.1 billion, which was in line with expectations. Adjusted earnings per share have exceeded Wall Street's expectations over the last four quarters. Activision started the year with a bang with a successful launch of its professional esports event Overwatch League. The game maker also saw strong engagement across its games, with users spending about 50 minutes per day playing them. In early October, the broader market got shaky, as concerns arose about the health of the overall economy, and this wiped out Activision's gains in the first half of the year. Shares declined 26.5% in value in 2018, according to data provided by S&P Global Market Intelligence. As a result, they underperformed the S&P 500, which lost only 6.35% in value last year. And even though Activision continued to post solid operating performance overall, investors didn't like its outlook for the holiday quarter, nor the fact that the company continues to see declines in monthly active users. The drop in users fed the concerns that the industry's most popular game -- Epic Games' Fortnite -- is taking players away from Activision's top shooters Call of Duty and Overwatch. Management's full-year guidance calls for revenue to grow 2.7% year over year to $7.355 billion and for adjusted EPS to climb 7.9% year over year to $2.46. With the stock price cut down by nearly half from its 2018 high, the valuation on the shares is more appealing at a P/E of 19.5 times management's full-year adjusted earnings guidance for 2018. As we move through 2019, investors will be watching how well players remain engaged with the company's key games. If Activision can match the consensus analyst estimate for adjusted EPS of $2.76 this year, the stock could rebound from here.